Rodent activity in lofts result in the insulation being contaminated with their droppings and urine. Contaminated insulation can cause serious health hazards for you and your family so we recommend that this is carried out after a treatment. Rodents can cause damage to insulation as well resulting in the insulation not functioning properly. At PEST UK we offer a service to remove this insulation and to install fresh new insulation. 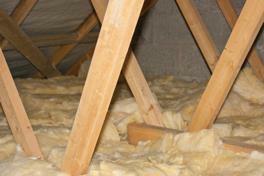 We will firstly take out of the loft all of the insulation and dispose of it in a safe professional manner. The technicians will then vacuum any droppings which are present in the loft space and carry out a biocide spray to make sure the loft is thoroughly disinfected. The final process will be to place new insulation into the loft. The prices include all materials. For lightly contaminated lofts we offer a Biocide treatment only. We do recommend that this service is carried out following on from a rodent treatment. Its vital that the infestation has been removed before any insulation work has been carried out. As well as the danger to health that rodent droppings & urine present there is another danger from pigeon droppings. Psittacosis is an infection of pigeons and some other birds birds caused by the bacterium Chlamydophila (formerly called Chlamydia) psittaci. The disease has been described in many species of birds, particularly in pigeons and doves. Infections in pigeons are important as they represent a biological hazard to human health. Pigeons can carry the organism without any signs of disease, or they can become mildly to severely ill.
Pigeons can transmit C. psittaci to humans; the resulting infection is also known as psittacosis or ornithosis. Transmission of disease from pigeons to humans occurs mainly through inhalation of airborne particles from respiratory secretions, dried faeces or feather dust. Oral infection and handling of infected birds’ plumage and tissues are alternative routes. Because human infection can result from brief, passing exposure to infected pigeons or their dried contaminated droppings, people should keep out of loft areas that have dried pigeon droppings. Psittacosis is an acute respiratory disease with an incubation period of between 1 and 4 weeks. It typically causes flu-like symptoms (fever, headache, muscle aches) but can lead to severe pneumonia and non-respiratory health problems.